President Donald Trump’s Executive Order 13769 — which limits entry to the United States for all refugees and individuals from seven predominantly Muslim countries — has been legally challenged. What does this mean for the U.S., its citizens and visitors to the country, including students? California State University, Northridge is hosting a panel discussion, “Challenging President Trump’s ‘Muslim Ban,’” to discuss those and other questions on Monday, Feb. 27, from 11 a.m. to 12:15 p.m. in the Jack and Florence Ferman Presentation Room of the Delmar T. Oviatt Library in the center of the campus at 18111 Nordhoff St. in Northridge. Taking part in the panel will be Syed Hussaini, outreach coordinator for the Council of American-Islamic Relations (CAIR) for the San Fernando Valley; Nisrin Elamin Abdelrahman, a graduate student at Stanford University; Phil Shigekuni, president of the Japanese American Citizens League of the San Fernando Valley; and Obaida Albaroudi, president of the Muslim Student Association West. 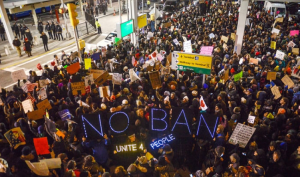 Hussaini will talk about the legal implications of the executive order, while Abdelrahman will talk about her experience a Muslim international student being stopped by customs agents at an airport. Shigekuni will explain U.S. history when it comes to detaining individuals, with a focus of the internment of Japanese-Americans during World War II. Albaroudi will explore the concerns American Muslim students have about President Trump’s actions. Tohidi said that since the election, the university has hosted a series of forums to explore concerns students have had about statements and proposals by President Trump concerning immigrants, Muslims and other issues. “This panel discussion is just one more effort to address the students’ concerns,” she said. For more information about the panel discussion, contact CSUN’s Middle East and Islamic Studies Program at www.csun.edu/meis or call (818) 677-7218.